It’s amazing what a change of scenery can do. What Wilcox and USC hope is that the school’s move into a new, $80 million building has a similar impact on students, producing better attorneys and improving the legal profession. 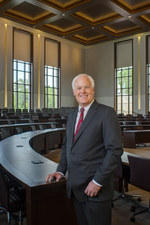 Columbia attorney Joel Collins, a 1968 USC law grad, has visited law schools across the country in his leadership roles with the American Board of Trial Advocates. “Our school is going to be as nice as any of them – and probably technologically ahead of them,” Collins says. The 187,500-square-foot building sits on the edge of campus, a block or so from USC’s historic Horseshoe. It overlooks Gervais and Bull streets, one of the busiest intersections in downtown Columbia. The front door is two blocks from the State House complex and Supreme Court. “From a community standpoint, the visibility is entirely different here,” Wilcox says. Indeed, the previous law school building was tucked into a hill between Main and Assembly streets, one of many nondescript edifices erected around Columbia by USC and government during the 1970s construction boom. It replaced Petigru College, which had been built in 1950. Stan Lacy, a founding partner with Collins in the law firm that bears their names, was part of the first graduating class in the new building, in 1974. “Petigru had a lot of character, but the law school had outgrown it,” Lacy says. This time, the priority isn’t growth. USC doesn’t plan to drastically increase law school enrollment from its current 630. 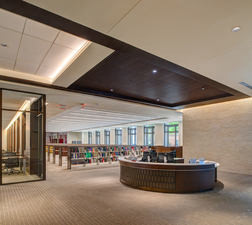 The new building brings faculty offices and classrooms closer together. The classrooms themselves boast the latest presentation technology and have been designed for greater intimacy. Flexibility was also a necessity for the new facility, designed by The Boudreaux Group and Smith Group JJR with construction management by Gilbane Co.
There’s also more informal gathering space in the new building. Lacy, who has served as an adjunct law professor at USC for the past 36 years, recalls his law school study groups. “We always met at somebody’s apartment because there was nowhere to meet at the law school,” he says. The building opened in May. Classes began in June. A formal dedication, which will also celebrate the 150th anniversary of the school’s founding, is scheduled for Sept. 14, with remarks from U.S. Supreme Court Associate Justice Samuel Alito. It will in some ways mirror the May 1974 dedication of the previous building, which featured Associate Justice Lewis Powell. Issues of the day also provide similarities. Gerald Ford, just months away from succeeding Richard Nixon as president, spoke in Columbia at a Law Day luncheon prior to the dedication.